ALBUQUERQUE, N.M. — Along with flying cars and instantaneous teleportation, smart bridges, roads and subway lines that can send out warnings when they’re damaged are staples of futuristic transportation systems in science fiction. 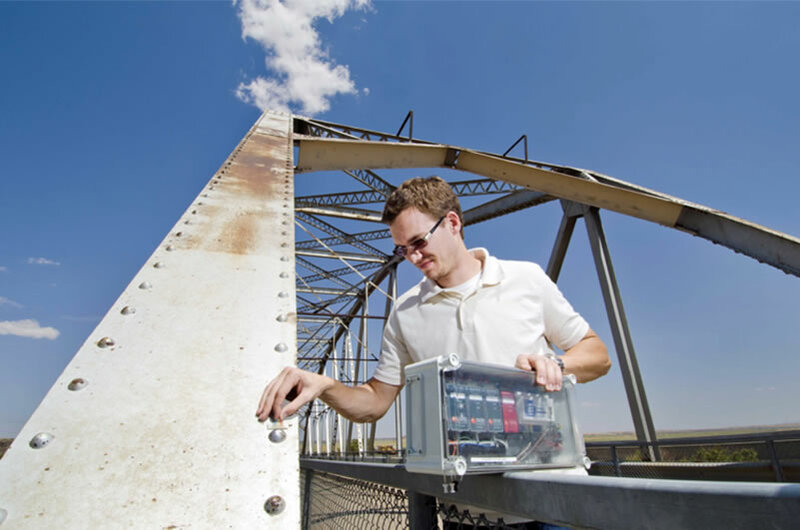 Next week, Sandia Senior Scientist Dennis Roach will present his team’s work at the ninth International Conference on Bridge Maintenance, Safety and Management. His presentation will include data on this trial bridge, a general assessment of the sensors used and his proposal for how to make structural health monitoring more routine in transportation infrastructure. Recently, Sandia and Structural Monitoring Systems, that has a significant presence in North America, worked together with Delta Air Lines Inc. and the Federal Aviation Administration to get the Comparative Vacuum Monitoring sensors industryertified for crack detection on commercial aircraft. Roach’s work with structural health monitoring for commercial aircraft began in 2001 through the FAA’s Airworthiness Assurance Center, which has been operated by Sandia for the FAA since 1990. The sensors can be produced in many different shapes, depending on the region that needs to be monitored, such as across a long weld or around a series of bolts. They can even be placed in a series in front of a tiny crack, to see whether it grows and if so, how fast. Each sensor has numerous control galleries and monitoring hardware so it can tell if there’s something wrong with the sensor or connecting tubes. Because of these control galleries, the sensors are practically fool-proof. Roach and his team also use piezoelectric sensors, fiber optics and printed eddy current sensors for structural health monitoring. Printed eddy current sensors, a Sandia-patented technology, can be installed on curved surfaces and use changes in a magnetic field to detect cracks. On the other hand, a network of piezoelectric sensors can monitor a wide area instead of just a few patches. Each sensor takes turns sending out a vibration through the underlying material that the other sensors receive. Cracks or other damage within the sensor network change the “pitch” of these vibrations. However, these pitch changes are more complex than the “yes” or “no” results from the comparative vacuum monitoring. Comparative Vacuum Monitoring is ready and certified for commercial use, the other technologies are still in different stages of lab and field testing.